On 4th May, 1979, something rather unusual happened on the steps of 10, Downing Street. The new Prime Minister of the United Kingdom stood on the steps in front of that famous black door and greeted the crowds, having led the Conservative Party to victory in the General Election. The obvious thing to note was that Margaret Thatcher, the 51st person to hold the highest office in the land, was a woman, the first and, so far, only woman to do so. In achieving this, she was also only the sixth woman to have led any Government in the world, following the likes of Sirimavo Bandaranaike in Sri Lanka, Indira Gandhi in India and Golda Meir in Israel. On her first day in office, Mrs. Thatcher famously quoted a prayer by St. Francis of Assisi, the patron saint of ecology, amongst other things. In the light of what was to happen during the following eleven years, the words of the prayer can be seen as being at least slightly ironic. In her rather posh and forced voice she said: “Where there is discord, may we bring harmony. Where there is error, may we bring truth. Where there is doubt, may we bring faith. And where there is despair, may we bring hope.” Amongst those who reacted to her victory was Jeremy Thorpe, the soon to be disgraced leader of the Liberal Party: ‘I am horrified. She makes Ted Heath look like a moderate.’ If only he had realised just how true those words would be – and how Mrs. Thatcher would go on to make most politicians of the post-war era, the time of consensus politics, look like moderates. The arrival of Mrs. Thatcher as leader of the Conservative Government marked a decisive change in the history of Britain, not just in policies but also in tone, vision and values. Her clear victory was, obviously, in part the result of the failings of the Labour Government of Jim Callaghan who had led the country through the late seventies following the shock resignation of Harold Wilson in 1976. Callaghan’s tenure can best be described as ‘troubled’ with the country in something of a decline, facing inflation of over 25%, needing an humiliating loan from the IMF and with soaring unemployment and widespread strike action. The famous ‘Winter of Discontent’ in 1979 provided the last few nails for the Labour ‘coffin’ and there was no surprise when the Conservatives swept to victory in May. Change was expected and change was going to come, although few people could have predicted quite how much the UK, Europe and even the world would be affected by the actions of Margaret Thatcher during the next decade. The fact that Mrs. Thatcher was a woman has always been a bit of an irrelevance really because she was also, of course, a politician. There is something quite naïve and even sexist about the idea that, because she was female, she would lead in a completely different way to every other Prime Minister there had ever been. If you look at the polices, look at the appointments and read the speeches, there is nothing ‘feminine’ about them – and why should there have been? She was a hard-headed, intelligent, decisive, opinionated politician who, like most of her predecessors had climbed the greasy-pole to power with energy and determination. What did people expect – some sort of “touchy-feely”, stereo-typically feminised approach to the huge and urgent challenges of the time? If they did, then they were fools. Margaret Hilda Roberts was born in Grantham, Lincolnshire, 1925. She was famously the daughter of a local greengrocer who went off to Oxford University to read Chemistry. She first worked for Joe Lyons in food manufacturing between 1945 and 1951. Her skills were used to study soap-making and the quality of cake and pie fillings but, despite many claims, she was not instrumental in the invention of soft ice-cream, something which Mr. Softee had achieved a decade earlier in the USA . Moving on from the world of science and ice-cream, she became a barrister before trying to win a seat as an MP for the Conservatives, eventually being successful in the General Election of 1959 when she was elected for Finchley in West London. Over the next 20 years, Margaret Thatcher (she had married Denis Thatcher, a divorced businessman, in 1951, having twins, Carol and Mark, the following year) took on various roles in Government and opposition. In 1970, she joined the Conservative Government of Edward Heath and was the Education Secretary (and, briefly, the Environment Secretary) until 1974, a role in which, rather interestingly, she was responsible for closing more Grammar Schools than any other Education Secretary. After the Conservatives narrowly lost both General Elections of 1974 to Harold Wilson’s Labour Party, Mrs. Thatcher challenged Edward Heath for the leadership of the Tory Party. She first defeated him and then defeated Heath’s choice as leader, William Whitelaw. Heath had never really liked Thatcher but this dislike took on a greater intensity after the leadership struggle and became a simmering antagonism until Heath died in 2005. So, by upsetting a few people, taking a tough stand on economic policies and offering a return to more traditional policies, Margaret Thatcher became the first woman to lead a major political party in Britain. And in 1979, an election which saw just 19 women elected as MPs, this would lead to her becoming the first and, so far, only, woman to be Prime Minister of the United Kingdom. Margaret Thatcher. I once knew someone in his 20s who had a photo of Mrs. Thatcher, the then Prime Minister, next to his bed which, by any standards, has to be considered quite strange. Mrs. Thatcher was in power as Prime Minister for eleven years from 1979 to 1990, the longest time in that office for anyone in the Twentieth Century. Some quotes from the ‘Iron Lady’ herself might be useful at this point as a way of indicating her values. ‘The Iron Lady’ was a name given to her by leading figures in the Soviet Union, a name she rather liked and sometimes used herself. What these quotes show is a specific set of values: clarity, determination, self-confidence, uncompromising, focused, individualistic. Mrs. Thatcher was a product of a different era of politics from those seen today. Although there was a tendency for the post-war Governments to act in line with the so-called ‘consensus politics’ of the centre, there was far more variety to be seen and heard amongst politicians. This was, after all, the era of the Cold War, a time when ideologies were stronger and opinions more extreme. Politicians tended to be older and more experienced than today. In an age when the media was not offering rolling news coverage, looks, voice and image were not so important and there was a greater variety of people elected as MPs. Many people could easily remember the dark days of the Great Depression and the Second World War, for instance, which had shaped and changed the lives of so many. Multi-national companies did not have quite the influence that they do today and people really saw that Governments could make a difference. Mrs. Thatcher was expected to make a difference to the fortunes of Britain, an ailing power which had fallen far from its once established position as a ‘Great Power’. And, maybe more importantly, Mrs. Thatcher herself expected to make a difference. The quotes above can be read as Mrs. Thatcher supporting ‘traditional’, even ‘Victorian’, values. For many people, though, she went much further than mere traditionalism to become the most divisive figure in post-war politics. She fostered policies that focused on individuals over communities, emphasised rights over responsibilities, allowed big business to flourish at the expense of workers and made ‘greed’ acceptable so that money mattered more than morals. She appealed to many different sectors of society, especially those who would go on to benefit financially from the changes she introduced. Mrs. Thatcher certainly gave an impetus to industrial growth after many years of decline in British economic fortunes and she prioritised economic growth, attacking what she saw as the ‘British disease’ of industrial unrest and strikes. Indeed, it was her attacks on the Trade Unions with the erosion of workers’ rights in favour of business which became a particular cause of her ‘Marmite’ status in the country. Her quote which said, “There is no such thing as society: there are individual men and women, and there are families”, probably summed up the ideas about what she got wrong in so many people’s eyes. Her rejection of the idea of ‘society’ seemed to raise the individual to a position which meant that selfishness, competition, confrontation were essential values. In her ‘dog eat dog’ world, there were always going to be more winners and more losers. The eighties came to be seen as the decade of greed, an increasingly individualistic period when no one could criticise or even challenge others, especially if the outcome was the making of profit. Mrs. Thatcher may not have created this situation on her own but her values have become interlinked with that time and her face is the image of the age for many people. In parts of the country, she is certainly held responsible for drastic decline in social and economic fortunes, so that the Tories continue to have to fight her name and her legacy in many constituencies at each General Election. One has only to look at the lack of Conservative or ‘Tory’ MPs in Wales, Scotland and Northern England to get a sense of the long term problems they have faced in getting back into power, something they only managed to achieve in 2010 through a coalition with the Liberal Democrats being needed to defeat Gordon Brown, an unpopular Prime Minister, at a time of great economic crisis. Many people believe that the legacy of Mrs. Thatcher played a crucial role in preventing the Tories winning a majority, with the situation in Scotland being especially clear. By way of comparison, at the 1983 General Election, the Tories won 14 of the 38 seats in Wales and 21 of the 71 seats in Scotland. Anyway, let’s look at what Mrs. Thatcher actually did and some of the major events of her time in power so as to get a sense of what people have loved and hated about her. Firstly, she won three consecutive General Elections: 1979, 1983 and 1987. This was a record for any British Prime Minister in the Twentieth Century (although Labour’s Harold Wilson won four of the five elections between 1964 and 1974). Her continuous time in office (11 years 209 days) was also a record for the 1900s, a figure which later on seemed to become a target for Tony Blair (10 years 57 days). Only some of the famous names of the 18th and 19th centuries could match her endurance, including Robert Walpole, William Pitt the Younger, The Earl of Liverpool and William Gladstone. As well as the time she was in power, Mrs. Thatcher also dominated Government and Parliament to such an extent that many people see her time in office as marking a clear move towards a more American-style of politics through the ‘Presidential’ model of leadership. Secondly, there was the impact of the ‘Falkland’s War’ (1982), the defining moment in her career. There had been a serious lack of economic progress in her first few years in office, with unemployment rising and high inflation still being major issues following the election victory of 1979. The early 1980s in Britain saw major industrial unrest, too, a sign that things were not progressing as she had hoped and it is fair to say that there was a potential crisis on the horizon for Margaret Thatcher and the Conservatives with a General Election no more than two years away. Then, in 1982, came the Argentine invasion of the Falkland Islands, the British Overseas Territory far away in the South Atlantic Ocean about 300 miles (480 kms) off the coast of Patagonia. A quick look at any world map, such as the one here, will show just how remote these islands are, some 8000 miles (11000 kms) from London. The islands were home to some 2000 British subjects, though, and Britain had a claim to the islands going back to 1776, with a settlement there continuously since 1833. The location was just one factor that made the Falklands a rather odd piece of British territory; it was rather like Argentina laying claim to the Isles of Scilly or the Outer Hebrides – or maybe the Isle of Wight. ‘Las Islas Malvinas’, as they are known in Argentina, had long been a source of tension between the two countries. With a military ‘junta’ (small group of generals) in control and seeking to distract the people from harsh economic and social conditions, they launched an attack to take control of the Falklands on 2nd April, 1982. Rather than negotiate and compromise, Margaret Thatcher went on the offensive and launched a ‘Task Force’ to liberate the islands. The ‘Falklands’ War’ (or ‘Falklands’ Conflict’ as it is sometimes called) lasted from 21st May until 14th June, 1982. It was won by the British forces and the Argentines were forced off the islands. 655 Argentines, 255 British and 3 Falkland Islanders died. It was not the largest war in British history nor the longest, but for many people it was of great significance as it was seen to restore some national pride, a sign that Britain was a serious player on the international stage and could not be ‘messed around with’. In some quarters, especially in the tabloid newspapers, Mrs. Thatcher was painted as a new ‘Churchill’, a modern hero, restoring pride and pointing towards a glorious future. These things may or may not be true, with recent history suggesting Britain can only really act in military union with the USA or NATO, but, in those dark days of 1982, the Falklands’ War was a powerful experience for many people. A sense of the rather direct, nationalistic feeling of the time from the famous front page of ‘The Sun’ newspaper, ‘Gotcha’, in response to the sinking of the Argentine warship, the ‘General Belgrano’. The Sun’s infamous front page, ‘Gotcha’, can be seen here. What is so often forgotten about the Falklands’ War is the terrible economic situation in Britain at the time which provided the background to the conflict. The Conservatives, and Mrs. Thatcher herself, were hugely unpopular in the early 1980s with price inflation running at a high of 21.9% in her first year as Prime Minister and with over 3 million people out of work, the highest being 12% unemployment in 1984. These figures were the worst under any Conservative Government in the post-war period and little better than the darkest days of the seventies. Unemployment was worst in the old industrial areas of Northern Ireland, Scotland, South Wales and the north of England, while London and the south-east was doing far better. There was major social unrest, rising crime and a sense of anxiety and division across the country. There was anxiety about the decline of traditional industry, concerns about the future for young people and a huge need for re-structuring and investment. And there was much fear, anger and frustration in the country as many people felt marginalised and ignored by the politicians at Westminster. When Argentina invaded the Falkland Islands, things were undoubtedly very bleak for Mrs. Thatcher and her popularity in the country was in free fall. As things turned out, Britain was, for many people, transformed by that victory in the Falklands. It gave a massive boost to Mrs. Thatcher’s status which saved the Conservatives in the General Election of 1983, one she called to take advantage of her popularity. Mind you, the Labour Party’s internal divisions and Michael Foot’s leadership in shifting to the left also made a pretty big contribution to the 1983 result. A third feature of the ‘Thatcher decade’ was a directed attack on the nationalised industries and the Trade Unions, an attempt to reduce the power of workers in traditional industries and to introduce greater freedom and power for employers and businesses. Mrs. Thatcher was a follower of the American economist, Milton Friedman, who believed in the power of market forces, individual choice and power in the hands of big business as the best way to drive an economy forward. She privatised most of the nationalised industries, such as telecommunications, gas, electricity and the steel industry, those massive, essential industries which had been brought under state or government control in the years after World War II ended. The first nationalisations had been the decision of Clement Attlee’s Labour Government, a case of economic necessity and socialist political ideology, between 1945 and 1951. However, both Labour and Conservative Governments had maintained these nationalised industries but some analysts believed they had allowed old working practices to remain in place by giving too much power to the trade unions. By the early 1980s, Britain was increasingly uncompetitive economically, with declining productivity and a lack of investment, leading many people to call it, ‘The sick man of Europe’. Various governments had tried to challenge and compromise with employers and unions but these had failed to deliver any real change. When she came to power, though, Mrs. Thatcher was clearly determined to address the issues in the way which she saw fit. In the 1980s, many of the nationalised industries were sold off: coal, electricity, the railways, water, steel and telecommunications were among those made available to control by the private sector. They were sold off relatively cheaply, floated on the stock markets and most of them soon saw massive profits for the new shareholders – but huge job losses and changes in working practices, too. The Trades Unions and millions of workers were furious, leading to a wide range of industrial action, as they saw their losses being turned into profits for the City of London, the accountants, the stockbrokers, the bankers and the already wealthy. The money seemed to be made on their pain – and not everyone was willing to accept it. These political decisions had economic and social consequences which led to the most important and iconic dispute of the Thatcher years: the Miners’ Strike of 1984-85. Under the leadership of Arthur Scargill (b. 1938), the President of the NUM (National Union of Mineworkers), there was a titanic struggle to stop privatisation, to save jobs and protect pay and conditions amongst Britain’s coal miners. Arthur Scargill: photo link – with remarkable hair as a special bonus. Mrs. Thatcher argued that Trade Unions distorted the free market by keeping wages artificially high, restricting competition and preventing investment. She believed that her policies would bring about the changes needed in working practices in an era where worldwide competition made such flexibility essential. Britain was deeply divided, almost in a ‘north-south’ split. The miners and workers in other heavy industries, such as steel and shipbuilding, tended to be based in the old industrial heartlands of Scotland, South Wales, the north of England and the Midlands. The business community, the ‘white-collar’ workers and the middle classes, tended to be found in the south-east of England and the more affluent parts of the country. The Miners’ Strike turned into a vicious dispute with serious violence and at least ten deaths. Reports were heard of concrete blocks being pushed off motorway bridges and going through the windscreens of lorries delivering coal during the dispute. Families were divided as some members broke the strike (the so-called ‘scabs’) while others stayed out on strike, suffering the economic hardship and black-listing that followed. In some areas, so many shops were forced to close that they became like ‘ghost towns’. Further Miners’ Strike photo links: here, here and here. In the face of the chaos and virulent attacks on her personally, Mrs. Thatcher stuck to her guns. Verbally abused by many as being heartless and dismissive of Britain’s industrial heritage and the ordinary working classes, she ordered the police in to the front line to break strikes. She argued her case with enormous power and commitment, meeting fire with fire. She forced through her changes in industrial laws as well as those for the privatisation of the nationalised industries. The strikes faded away in the end, as people were broken financially, if not ideologically, and were forced to accept the changes. In doing this, Margaret Thatcher established herself, in some eyes, as a leader of principle and commitment, hailed by her supporters as the finest Prime Minister since Churchill and one of the greatest leaders of the century. In a poll for the “Sunday Telegraph”, she actually received 34% of the vote for the ‘Greatest Prime Minister of the Century’, with Churchill second on 15% – which probably says something interesting about the readership of the ‘Telegraph’ as well as the esteem in which Mrs. Thatcher is held in some quarters. On the international stage, Margaret Thatcher became a major figure, most of all for her part in the collapse of Communism in Europe and the USSR. While Ronald Reagan and Mikhail Gorbachev were the main players in those extraordinary developments, she had a highly significant role in international affairs, rather similar to that of Pope John Paul II. Both she and the Pope seemed to embody a steeliness and commitment towards the USSR, so that their anti-Communist beliefs inspired President Reagan in particular to act in a more decisive and aggressive manner. The support given to the USA by the British leader made her a firm favourite with many Americans, a factor which led to her making lots of friends (and a lot of money) there in business and on the lecture circuit after she retired from politics. One other area in which Mrs. Thatcher played a role of great significance was in Northern Ireland, especially through her clear and focused resistance to the IRA. During her time in office, there were many terrorist attacks in the province and on the mainland, with the most famous being the attack on the grand Hotel at Brighton in October, 1984, during the Conservative Party Conference. The bomb, which was set by Patrick Magee of the IRA, killed five people, injured 34 others, and came close to killing Mrs. Thatcher herself. Her determination in going on to deliver her speech at the conference was seen as a remarkable show of courage by many people, supporters and opponents alike. The bombing was presented by the IRA as a warning to the Conservative Party and the British Government that it could not ‘occupy Ireland and torture its prisoners’. This was a reference to the historic dispute over Irish independence as well as more recent issues such as the ‘Hunger Strikes’ at the Maze Prison in 1981. Mrs. Thatcher held an uncompromising line against the IRA and other Republican organisations throughout her time in office, and she was a hugely symbolic figure in Northern Ireland. As with her role in the collapse of Communism, Mrs. Thatcher’s part in ‘The Troubles’ will be looked at in more detail in another section. Margaret Thatcher was forced out of power by her own party in November 1990. It’s an interesting story in its own right, peaking with a remarkable resignation speech delivered by her former Foreign Secretary and Deputy Prime Minister, Geoffrey Howe. A previous verbal attack by Howe on Labour front-bencher Denis Healy had been described as rather like being ‘mauled by a dead sheep’, so ineffective was he; this, however, turned out to be a devastating speech which put the final nails into Mrs. Thatcher’s political coffin. His statement included the memorable cricketing analogy regarding her role in restricting his ability to negotiate with the European Union on the EMU (European Monetary Union): “It is rather like sending your opening batsmen to the crease, only for them to find, as the first balls are being bowled, that their bats have been broken before the game by the team captain”. Margaret Thatcher resigned as Prime Minister and leader of the Conservative Party on 22nd November, 1990. She had become a political and electoral liability so that people would no longer take her strong, direct, bullying style; they had accepted it while she was a winner but turned on her when their own political careers were under threat. It was, for some, a tragedy and a betrayal that she was forced from office in a cowardly manner; for others, there was a mixture of relief and delight that she was no longer able to cling to power on her own terms. Few people were indifferent to her fall and it is interesting that John Major, her successor, was a very different character in style and attitude. Mrs. Thatcher inherited a country on the verge of collapse in the ‘Winter of Discontent’ when the Labour Government of James Callaghan was facing disputes on almost every front and showed how alienated his government was from ordinary people. In those early years, she was far from popular but there was a strong feeling amongst many people that change was needed. In this way, she had significant support for her attacks on the Trades Unions as she attempted ‘to heal the sick man of Europe’. The Falkland’s War gave her a huge boost, as did her role in the changing relationship with the Communist world, her friendship with Ronald Reagan and her presence on the world stage. However, it is interesting to remember that one of the final things with which she was associated, the infamous ‘Poll Tax’, was itself a sign she herself had become out of touch with the majority of people in the country. The imposition of the ‘Community Charge’, as the ‘Poll Tax’ was known, was the cause of some of the most violent riots in recent British history. Her fall suggested that she had certainly failed to create a country which was truly content. Baroness Thatcher died in April, 2013, at the age of 87. Her extraordinary ability to divide public opinion persisted beyond life as the country was split almost exactly 50-50 as to whether she had been a force for good or ill. But while many saw her as the woman who saved the country and others as the one who tore it apart, the truth was almost certainly somewhere in between. Studies of her economic influence, for example, show that she was far less positive than her supporters claim and far less negative that her opponents would have us think. Maybe more important was the perception, the tone, the image; the tough talking and victory in the South Atlantic; her appearance as a player on the world stage which reminded people of a new Churchill; and the way she exuded self-confidence and determination. Some people hate her memory to this day while others really do miss her. It will probably be like that for a long time to come. Books: ‘Margaret Thatcher: The Authorized Biography, Volume One: Not For Turning’ by Charles Moore (Allen Lane, 2013) is very highly regarded and considered by many critics to be one of the finest political biographies of recent times. ‘Margaret Thatcher’ by John Campbell is another extremely powerful biography in two volumes (‘The Grocer’s Daughter’ and ‘The Iron Lady’ (Vintage, 2007). Works by Margaret Thatcher herself include ‘The Path to Power’ (Harper Press, 2012) and ‘The Downing Street Years’ (Harper Press, 2012). TV: ‘The Rise and Fall of Margaret Thatcher’ contains two well received plays made by the BBC. They are fictional but contain many points of interest as a useful background. Songs: Many bands produced music which reflected the economic and political conditions of the 1980s, as well as reflecting on the Falkland’s War. Some of those worth checking, with several being folk songs, include: The Specials – ‘Ghost Town’; The Beat – ‘Stand Down Margaret’; lots of Billy Bragg including – ‘Which side are you on?’, ‘Thatcherites’, ‘Island of no return’, ‘There is power in a union’; Martin Carthy – ‘Company Policy’; Elvis Costello and Robert Wyatt – ‘Shipbuilding’ and Elvis Costello – ‘Tramp down the dirt’; and the little-known but legendary Vin Garbutt – ‘The Dark Side of the Moon’. Film: ‘The Iron Lady’ (2011). Meryl Streep’s portrayal of Mrs. Thatcher was considered remarkable although the film itself divided opinion. It does not really deal with the issues of the time but may be of interest for its insights on her values, attitudes and goals. 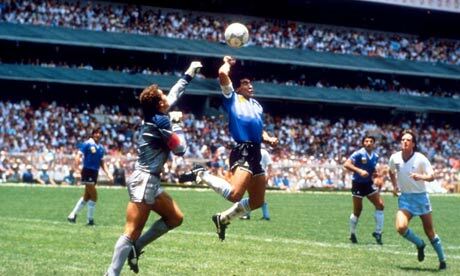 If you like football, the famous Maradona ‘Hand of God’ goal in the quarter finals of the Mexico World Cup in 1986 links very much with the Falklands’ War. The Argentinean team saw the match as an opportunity for revenge against the English for the injustice and humiliation of defeat. The blatant cheating of the first goal followed by the brilliance of the second, one by Maradona’s left hand, the other from eleven touches with his left foot, were greeted with sublime joy in Buenos Aires and elsewhere across the country. The first goal showed Maradona was cleverer than the English and the second was the sublime example proof that he was more skilful than them, too. That day in the Azteca Stadium in Mexico made millions of Argentine’s very happy indeed. The result was a 2-1 win for Argentina, by the way. Gary Lineker, the man with greying hair who presents ‘Match of the Day’ got England’s goal; he used to be very good. The adulation for Maradona in Argentina is based on more than this one game, of course, but his two goals, one through ‘guile’, the other through genius, came to embody something important for many Argentines. Some of Maradona’s fans have gone so far as to set up a church in his honour where they remember and celebrate his greatness, with the game against England being one of the particular highlights. His achievements gave hope and confidence to millions of Argentine’s and there is no doubt that a large part of their joy came because he brought such a famous victory against England just four years after the Falkland’s War. ‘In front of everyone, both the citizens of Kiev and the German occupants, they could prove what great players they were without being humiliated and without bowing down to anyone.’ Makar Goncharenko, player for FC Start. History is a complex topic at times. How do you know or trust information if you weren’t there? Let’s face it, most great and important historical events have happened in pretty messy or unclear circumstances. They are open to so many influences that can twist or obscure their meaning, that the issue of interpretation is just about the most complicated thing to consider when ‘doing’ history. It makes things fascinating and controversial as well as ensuring that the debates and arguments about what happened and why they happened will, in many cases, never be decided. This is the case for most of history, in fact, there being so little by way of careful, detached analysis for most events, especially those of the distant past. Pre-historic events, such as why Neanderthals died out, are obviously riddled with challenges around gathering, as well as interpreting, the evidence; ancient events, such as Adam and Eve, Noah, Moses and the Prophets, as recorded in the Old Testament, are full of allegory and clearly have a powerful religious dimension which impacts on their purpose; and deciding why wars, such as the Great War, the Vietnam War or the Cold War, developed as they did will always be affected by who won and who lost. We have to accept that people in the past have not always presented the events of their time, the history of today, in a calm, clear and detached manner. There is nearly always some extra message, a value or a purpose, which impacts on the interpretation of the event, just as there is when two football managers discuss the match they have both just witnessed: ‘It was clearly a penalty’, against, ‘It was never a penalty’, is an obvious case in point. One area of particular interest in historical events is to do with legends. Such stories are a natural part of the human story and the oldest stories we seem to have, the likes of Homer’s ‘The Odyssey’ and ‘The Iliad’ are just that. There may be a germ of truth in them, maybe quite a lot of truth, but they get changed in the telling so much that they lose any credible connection to the original and are, as such, unbelievable. Such is the case with stories such as King Arthur, Robin Hood or Dracula, where the real person may have existed but the stories that grow up around them come to obscure the truth. History is full of myths and legends that have the power to shape our language, beliefs and actions to this day; one only has to look at the obsessions with the Loch Ness Monster, the Yeti, UFOs and the regular forecasts of Armageddon linked with some ancient prophecy to see that such stories retain their influence on many people. Legends develop for various reasons. They can be used to explain an attitude or belief; they can be used to justify an action; they offer links to origins and identities of peoples and nations; they might explain why things have gone wrong in the past and so make demands on today; they can give peace and hope to people who are suffering. Legends are powerful stories and they cannot be ignored by historians nor dismissed just because they are not ‘true’. To do this is to ignore the power and the purpose of the story. It is important that they are recognised as part of a culture and then examined to explain what they say about that culture, the people and the time from which they developed. The fact that they are believed and valued is an essential part of the legend. One only has to look at the many references to Robin Hood in the light of the banking and economic crisis of 2008 to the present day or the power of Dracula to inspire the hugely successful ‘Twilight’ series to see that ‘truth’ is not the only way in which historical events affect and shape our lives today. The difficulty of distinguishing fact from fiction is not just a thing of the deep past. There are many events of more recent times which have been open to great debate with issues about just what happened being very difficult to discern. In some ways, the story behind every trial that comes to court, every politician who rises to power, every act of terror or war, is open to some form of interpretation and opinion. These interpretations are based on selecting the truth, highlighting some things over others, exaggerating the good or ill in the work of certain figures and drawing certain messages and consequences over others. With intelligence, care and determination, things can be agreed and reasonable conclusions drawn – but to be a ‘good’ historian is a most difficult challenge. One particular event comes to mind as an example of this challenge. It is quite an obscure event in some ways but one which has become far better known in recent years, rooted in a game of football that took place in Kiev, Ukraine, in 1942. The match happened during World War II and inspired a Hungarian film called ‘Két félidő a pokolban’, or, ‘Two Half-Times in Hell’ from 1962. In 1981, this in turn inspired a Hollywood film, ‘Escape to Victory’, which remarkably cast the Rambo actor, Sylvester Stallone, alongside some famous footballers, including Pele and Bobby Moore. As happened with another famous war film, ‘The Great Escape’, the truth got rather twisted and some people came to believe that the film really was a factual account of a true event with Brazilians, English, Scottish, American and Argentine prisoners somehow coming together to defeat a team of German soldiers. Further films have been made about the game, a recent example being a Russian one entitled ‘Match’. It was released just before the European Football Championship of 2012 which was jointly hosted by Poland and the Ukraine. This particular film cuts to the heart of the difficulty of separating the fact from the fiction as it portrayed the Ukrainian players in a very different light from that of ‘Escape to Victory’, for example. Whereas that film had shown the players to be heroes against their opponents, ‘Match’ portrayed the Ukrainians as Nazi sympathisers, which is quite a difference. The truth, it is fair to say, is rather hard to discern, even though this was quite a recent event and many people survived to tell the story well into the 1990s. Moving beyond the legend is incredibly difficult. Here is a version of the story of the now famous ‘Death Match’. It shows that, despite what some people say, sport really can be important and influential for a nation. This version emphasises the positive from the players and the Ukrainian perspective. It shows how a team of local footballers caused great annoyance to the Nazis, who were occupying the Ukraine, by refusing to capitulate to their demands that they should stop being so good. Even though they were malnourished, had little by way of proper kit and had little chance to practise, these players ran rings around the ‘stars’ of their military opponents, humiliating them in the process. As we will see, it would all end in tragedy but why did these men even find themselves playing football against the elite forces of the German army in the depths of the war in Kiev during the summer of 1942? FC Start was a football team in Kiev, in the Ukraine, not far from Chernobyl where the nuclear disaster of 1986 happened. They played for just one season during World War II and they beat everyone they played: played 9, won 9, 58 goals scored, 10 conceded. Theirs is a story of true heroism and skill but it is still relatively unknown in the West, a story lost in the political mists of time because hearing such positive tales about people who were under Communist control after the war was just not the ‘done’ thing. The key figure behind FC Start team was a man by the name of Iosif Kordik, who controlled one of the local bakeries, in Kiev, which was the capital city. The Ukraine had been invaded by the Wehrmacht forces, the German Army, as a part of ‘Operation Barbarossa’. Kiev itself was occupied in mid-September, 1941. One day, Kordik bumped into one of his heroes, a footballer called Nikolaï Trusevich. Trusevich had been the goalkeeper for Dynamo Kiev before World War II and, now that he had returned home from a prisoner of war camp, where he had been held after being captured by the Germans, he was in need of a job. Kordik invited him to come to work for him at the imaginatively titled, ‘Bakery No. 3’. The German guards had actually released Trusevich and other Russian soldiers so that they did not have to spend time and resources guarding them; they were released with no papers so that they could not get any work, food or accommodation and were therefore expected to starve or freeze to death. It was a solution which would be cheaper than guarding and feeding them. Within a short period, several other former footballers had gathered at Bakery No. 3, most of them having played for two rivals before the war: Dynamo Kiev and Lokomotiv Kiev. When the German Wehrmacht, who controlled the region, put together a football league to give themselves, and other soldiers from Hungary and Romania, something to do, the players at the bakery were allowed to enter a team and they took the name ‘FC Start’. Nazi superiority was expected to be shown over their military allies as well as the local population. The local players were always short of food, tired from working shifts of up to 24 hours and in fear for their lives because of Ukrainian informers to the Nazis. They lacked proper kit, wearing cut down trousers and work shoes instead of boots. They were not allowed to train either, although they were so malnourished that this was not their biggest problem. There were serious doubts in the team about whether they should actually play or not. It took a brief speech by Trusevich to decide the issue. By coincidence, a set of red woollen shirts had been found a few days earlier. Holding one of them, he said to the others, ‘We do not have any weapons but we can fight with our victories on the football pitch…we will play in the colours of our flag. The Fascists should know that this colour can never be defeated.’ They all chose to play. From their first match, FC Start were the outstanding side in the competition, overcoming their physical problems thanks to great skill, tactics and teamwork. Victory after victory followed but things got tougher when they beat PGS, a German garrison team, 6-0 in July, 1942. This was simply not supposed to happen as it humiliated the German players and the ‘system’ which saw them as superior to the local people. Sport really was supposed to show Aryan supremacy, but, as in the Berlin Olympics of 1936, things were not going to plan. On 6th August, FC Start were to face their toughest challenge against ‘Flakelf’, ‘the Flak Eleven’, a newly formed team from the German Luftwaffe. It included some pilots but more players came from the anti-aircraft groups around Kiev. They won easily, 5-1. But immediately after the match, a return fixture was arranged for the following Sunday, 9th August: it would become the ‘Death Match’. A large crowd gathered for the match. It began with Flakelf giving the Nazi salute and shouting ‘Heil Hitler!’ The Ukrainians had been ordered to do the same by an SS officer who spoke to them before the match in the changing rooms. But as they slowly raised their hands, they put their fists to their chests and gave the cry of the Red Army: ‘Fizcult Hura!’ (literally, ‘Physical Culture, Hooray!’ but better translates as ‘Long live sport!’). Not surprisingly, the Nazis were furious. The same SS officer who had ordered them to give the Nazi salute was to be the referee for the match. The players had been advised to throw the game for their own safety but as the game started they decided just to play. Chaos broke out soon enough as the referee ignored all fouls by Flakelf even when the FC Start goalkeeper, the famous Trusevich, was deliberately kicked in the head. Flakelf took the lead while he was still dazed. But FC Start would not give in and they struck back, scoring with a long shot before another player, Makar Goncharenko, dribbled around the whole Flakelf team to score a stunning goal, even as they tried to grab him and kick him from behind. A third goal before half-time saw FC Start in control of the match. The Nazis were, to say the least, unhappy. During half-time, the SS officer and a Ukrainian collaborator returned to the changing rooms to both warn and threaten the players that they could not, and must not, win the game. Serious consequences were threatened if they did win. However, in the second half, things were much quieter and both sides scored twice, leaving FC Start 5-3 up. Then, towards the end of the game, one of the Start team, a defender called Klimenko, dribbled around the whole of the Flakelf defence, went round the goalkeeper up to the goal-line but refused to score and, instead, he turned to kick the ball back towards the half-way line. It was the ultimate humiliation of the German team as this ‘sub-human’ Ukrainian could choose not to score against them – and still win. The whistle was blown early to save Flakelf further embarrassment. The FC Start players did not celebrate but guard dogs were turned on to the crowd of supporters. The Nazi leaders in the crowd were jeered as they left the ground. Hungarians and Romanians with the army had been seen supporting FC Start and mocking the Germans. Something had to be done. The local Nazi leaders decided what to do but waited until FC Start had played and won their final match, 8-0, to win the league. They then turned up at Bakery No. 3 and rounded up all of the players. They were taken to the SS headquarters and interrogated in the hope that they would admit to being involved in activities against the Germans but none did so. One of the team, though, Korotkykh, was exposed as a member of the NKVD, Stalin’s Secret Police, when his sister told the SS: he was tortured and killed. As the others refused to break, they were sent off to labour camps where several of them died by being clubbed to death and then shot through the head. Three of those who died were executed as retribution for a partisan attack on a local factory. One in three of those held at the Siretz Camp were executed and they included the heart of the FC Start team: Ivan Kuzmenko, their giant striker; Alexi Klimenko, the young defender who had dribbled around the Flakelf team before refusing to score; and Nikolai Trusevich, the great goalkeeper and the man who brought the team together after going to work at Bakery No. 3. Some of the team did survive the war but then faced the backlash of those who saw them as collaborators for playing football with the enemy. Worst was the threat posed by Joseph Stalin who sent so many former prisoners of war and civilians who had contact with the Nazis to the Gulags or death after 1945. The full story of FC Start was suppressed for many years and only came out in 1959, long after Stalin’s death, and it is really down to two Soviet leaders that it happened. Nikita Khrushchev and Leonid Brezhnev, who was himself a Ukrainian, were instrumental in seeing that the remarkable story of FC Start found a wider audience. It was a part of ‘peaceful coexistence’ really, an example of heroism and human endurance, as well as skill, in the face of fear and hatred. For Khrushchev and Brezhnev, the witness of FC Start was an example of anti-Nazism from within Communism, a sign to the world of the strength of their system and way of life. Today, a monument stands to the players of FC Start outside Dinamo Kiev’s ground. Makar Goncharenko, was the last member living of FC Start. He died in 1996, but four years earlier, he spoke of the team and the ‘Death Match’. He did not see any of the team as heroes, not even those who died. For him, they were just ordinary people caught up in a brutal war, a war that saw that saw the population of Kiev fall from 400 000 to 80 000. The men who played for FC Start were no different from the rest of the community; thanks to their sporting ability, they just played a different role in the struggle. Monuments to FC Start at the Kiev stadium: photo links here and here. These are clearly evidence that some people thought something important had happened at FC Start. And there is another important memorial, see below, linked with the ‘Death Match’. It is at Syrets Concentration Camp, where three of the players were amongst the estimated 25 000 who died. The camp was close to the infamous massacre site at Babi Yar. So, that is the positive interpretation of the story and it is one which is powerful and emotional, a classic example of the ‘David and Goliath’ struggle. The heroes are clear, the monuments are built, the memory is enshrined in the stories and the films. But it is not quite so straight-forward and many believe that a different interpretation is necessary. Part of the problem is to do with confusion over what actually happened in 1942 and part is to do with Khrushchev and Brezhnev, the leaders of the USSR, and how the story came out. There seems to be no doubt that the football season of 1942 did take place, including the teams mentioned, such as Flakelf and FC Start. The result in the ‘Death Match’ was almost certainly a 5-3 victory for FC Start and, within six months, half of the team had died. But then things get messy. How come the local officials of the Nazi occupiers never checked the papers of the FC Start players? They would easily have found out that they had none. Many local people were accused of being collaborators with the Nazis and some believe that the team must have included such people, as portrayed in the Russian film ‘Match’. And were the deaths that followed the game directly a result of the football or just a part of the huge suffering of the Ukrainians in the war? It is estimated that eight-ten million Ukrainians died during World War II, a higher percentage than any other nation, despite evidence of collaboration with the Nazis by some people; in such horrible circumstances, such things were, surely, to be expected. Starvation was the biggest cause of death, a further horrid famine that stands alongside the tragedy of 1933, ‘The Terror-Famine’, when up to seven million more people, mostly Ukrainians, died thanks to the consequences of Stalin’s first ‘Five Year Plan’. Clearly, the fact that four or five players died within six months of the match is no surprise; they may not have been shot. The suffering of the people and the obvious expectation of collaboration, as in France, for example, was a particular problem when the tide of the war turned against the Nazis. Following that great turning-point, the Battle of Stalingrad, the German forces were decisively pushed back and forced out of the USSR. In the wake of this, Joseph Stalin was ruthless in his pursuit of anyone who might have been seen to have collaborated with the Nazis in any way. After the war, he famously sent Soviet Prisoners of War, who had been imprisoned in the west, straight out to gulags in Siberia for fear that they had been intellectually ‘contaminated’ by the experience. The Ukrainians feared that they would be part of the back-lash and the story of the ‘Death Match’ was covered up until after Stalin’s own death in 1953. If there was a clear story of anti-Nazi activity, surely it would have been used to impress Stalin? The story only came out under Khrushchev and Brezhnev, presented as a story of how good the Communists had been in opposing the Nazis during the war. It is all a bit too convenient for some people. The truth is that many people do not believe the story of the ‘Death Match’ as told above. They say that those who survived and re-told the story, such as Makar Goncharenko, changed their version of events many times, almost in every re-telling. Also, there were discrepancies between different players and a lack of consistency with any surviving spectators from the estimated 2000 who attended. Marina Shevchenko, a local historian who works at the local museum of the Great Patriotic War, believes that the match between FC Start and Flakelf did take place on 9th August, 1942, and the score probably was 5-3 to FC Start – but it was not a ‘Death Match’. The story is the stuff of legend, a spin placed upon an event played out under the most frightening circumstances – and formed into a legend to protect and justify people who then faced another bout of horror from their own rulers. It was given added energy by other politicians who wished to cast a positive light on Communists during the Cold War and that was then muddied further by Hollywood. A further twist is given by the ‘celebrity’ enjoyed by certain key players in the match who could hardly do more than re-tell the story everyone wanted to hear, the truth having long been submerged in the myth of patriotic glory. And the Russian version of events in ‘Match’ from 2012, also adds in that element which comes from a historic dislike and distrust between nations. The Death Match. The stuff of legend. Just like Robin Hood, really?